Nikola Jokic has had a remarkable, MVP-caliber season, and the Denver Nuggets wouldn’t be anywhere near their terrific 51-25 record without him. 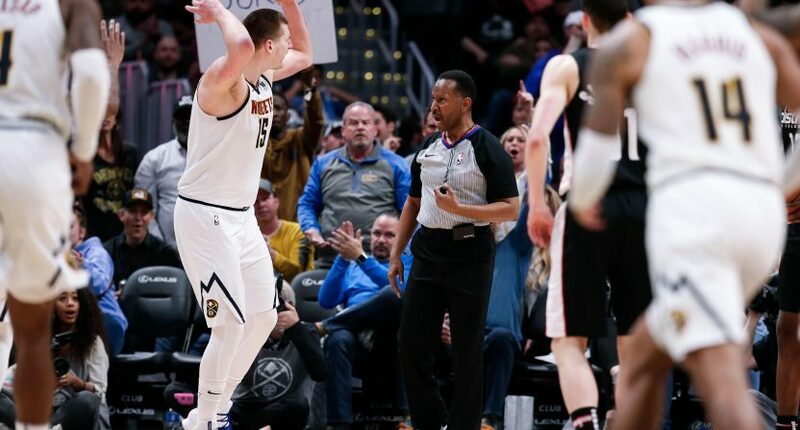 But on Sunday night, he was ejected late in what may have ended up being a game-changing moment in Denver’s 95-90 loss to the Washington Wizards. Jokic made a layup to tie the game 88-88 with 3:47 remaining in the fourth quarter, and was angry he wasn’t fouled. So, he yelled at an official, and was quickly given two technical fouls for an automatic ejection. We don’t know what was said here, but unless it was *awful*, should the the official have thicker skin in such a crucial moment of the game? Probably. But should Jokic also do a better job of keeping his composure in such a crucial moment of the game, as the best player in the building? Probably. Denver was outscored 7-2 the rest of the way to lose to a Wizards team that is quite bad. With the win, Washington is 32-46 and 10-30 on the road. Denver entered the game as 10.5-point favorites, with a 31-6 home record. This would’ve been a really annoying loss for the Nuggets regardless of its playoff implications, but it’s especially bad when you add in the potential playoff implications. The Nuggets are now one game back of the Golden State Warriors (52-24) for the No. 1 seed in the Western Conference, with six games left to play for each team. The Warriors host the Nuggets on Tuesday (in what’s sure to be an intimidating Oracle Arena environment), and then have a very favorable five games to finish out the regular season: at Lakers, vs Cavs, vs Clippers, at Pelicans, at Grizzlies. Denver’s schedule is much more difficult: vs Spurs, vs Trail Blazers, at Trail Blazers, at Jazz, vs Timberwolves. So, the Nuggets really couldn’t afford to lose on Sunday night in order to get the top seed, and they could really, really use the top seed. They have the second-best home record in the NBA, but have been pretty mediocre on the road with a 20-18 record. Their odds of beating the Warriors in a seven-game series would’ve still been bad even with home-court advantage, but without it? That would likely be a quick series. And with the loss, Denver’s lead over the Houston Rockets for the No. 2 seed is only two games. Five Thirty Eight now gives the Nuggets only a 2% chance of reaching the NBA Finals. The Warriors (73%), Rockets (16%), and even the Utah Jazz (5%) and Oklahoma City Thunder (4%) are all given better chances to represent the West in the Finals.